Space Exploration Technologies, led by billionaire Elon Musk, is poised to break into the U.S. military’s $70 billion launch market after winning its first missions from the Pentagon. The Defense Department on Nov. 27 directed the Air Force to end a launch monopoly held by the government’s two biggest contractors, Lockheed Martin and Boeing. A week later, the service awarded the trial missions to Musk’s firm, known as SpaceX. The Lockheed-Boeing venture has had a lock on the business for six years. SpaceX, which recently showed it could fly to the international space station, now has the opportunity to prove that its rockets are capable of launching satellites serving Pentagon planners, ground troops and the nation’s spies. The two launches were awarded to Hawthorne, Calif.-based SpaceX under an Air Force contract valued at as much as $900 million. The missions, scheduled for 2014 and 2015, are designed to help the company become certified to carry the military and spy satellites. SpaceX twice this year flew its Falcon 9 rocket carrying a Dragon spacecraft, which delivered cargo to the space station. With the new military business, executives see the firm’s total launch business as stable, if not growing, company President Gwynne Shotwell said at a Dec. 11 space industry luncheon in Washington. “Now, I think a big challenge is for us to do this hard job and produce the vehicles and launch them reliably,’’ she said. Robert Stevens, chairman and chief executive of Lockheed, poked fun at SpaceX’s inexperience. The Lockheed-Boeing venture, known as United Launch Alliance, has launched “hundreds of billions of dollars’’ of satellites on 66 consecutive missions, Stevens said at a Dec. 14 Bloomberg Government breakfast in Washington. Although Centennial, Colo.­­based United Launch Alliance has a successful launch record, it has struggled to control costs. The average price of its Delta 4 and Atlas 5 rockets is estimated at $464 million a launch, more than double a previous estimate of $230 million, according to the Pentagon. SpaceX’s October launch to the space station was the first of at least a dozen cargo flights under a NASA contract valued at $1.6 billion. Although SpaceX’s Falcon 9 rocket successfully lifted a cargo ship to the space station, the mission wasn’t flawless. Less than two minutes after liftoff, one of the rocket’s nine engines shut off, causing the loss of a communications satellite made by Orbcomm. SpaceX is investigating what caused the engine failure. The company will need to avoid these kinds of malfunctions to get a piece of the Defense Department’s biggest launch program, said Foust, the Futron analyst. “They need to build up a track record of success and allay any concerns at the Pentagon about turning over very expensive and very important national security business to anyone other than ULA,’’ Foust said. The program, known in military parlance as the Evolved Expendable Launch Vehicle, is estimated to cost $70 billion through fiscal 2030. SpaceX lists the Falcon 9 at $54 million a liftoff. The company is building a bigger rocket, called the Falcon Heavy, which it says will be second in size only to the Apollo-era Saturn V and cost between $80 million and $125 million a liftoff. It plans to launch it for the first time in the second half of 2013. Shotwell said the military launch costs will be higher in part because of the additional requirements. She didn’t elaborate on the prices. 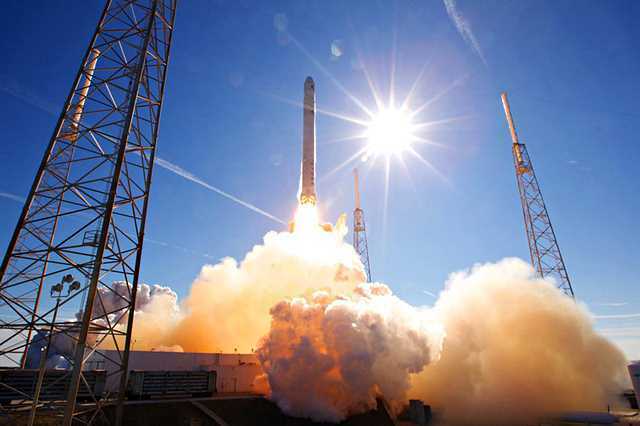 SpaceX officials want the company to get its military certification in 2014. It will need to launch each version of a rocket successfully three times before it can receive the Defense Department’s approval, Shotwell said.